Irandam Ulagam is thematically closer to Darren Aronofsky’s The Fountain. Both these films dwell on themes of love and death; the lead actors play different characters in different worlds and are involved in a romantic affair; and finally, both are ambitious but ultimately maddening. Given that this otherworldly planet is the film’s USP , this is disappointing. The disjointed way in which the scenes play out in this world at times makes one wonder if we are seeing the film version of a feverish dream Selvaraghavan might have had. The film has an unreal fairytale-like quality that prevents us from feeling the intensity, passion and pain of the characters. It seems more like a child’s bed-time story. Everything from the unique costumes, make-up and body language gives the film a storybook and dream-like quality. Irandam Ulagam is an ambitious project by a director who always strives to give a different and unique experience to his audience. The screenplay is abstract and complicated and it would call for an expert (besides Selva!) to decipher what the story is all about. Topping the confusion are the sequences that juggle between the two worlds. After a point, viewers give up, trying to track the sequential presentation. Worse, the pace is slow and sluggish though the lovely locales and the camera angles compensate duly. The interval break leaves the audience in utter confusion. Things were expected to improve in the second half but unfortunately it got worse and the climax did the wrap up job of ensuring every viewer has enough bumps on the head with blank thoughts. There is no clue what the producers saw in the story, no idea why Anushka saw potential. All in all, this is one mess of a product but a good lesson to filmmakers on how not to make a film. ‘Irandam Ulagam’ is a complete experience. It doesn’t have the usual high amounts of action, romance, comedy and masala as a normal Kollywood film would have; though it has all of it, everything is in moderation. A love story beyond one this world, the film is not a thoroughbred strictly Indian flavour, but is meant for the world audience at large. Savouring tastes of global interests, the film is a fair choice of being a multilingual international movie. In all ‘Irandam Ulagam’ is for the wise audience. A good production house with deep pockets was taken for a ride by the director with a farcical script and atrocious screenplay. Films like ‘Varna’ are a rarity. They fall into the ‘never before, never again’ category. Film school students must be forced to watch this film. Perhaps, Christopher Nolan can also take a look as this film has a lot more ‘depth’ compared to ‘Inception’. Selvaraghavan has come up with unconventional yet unconvincing storyline. But the script is shabby and terribly executed. The entire plot gets revealed in the first hour and Selva fails to engage the audiences with the proceedings. Screenplay is pathetic and the character developments are quite weak. Also the two stories are loosely connected that the feel goes totally missing. The twists and turns never takeoff or offer us some surprise in this fantasy genre film. In the end, audiences only wonder what exactly is the story!!! The computer graphics and post production processing look mostly unimpressive unless the viewer wants to give grace points for the effort just because it is a Tamil movie. The overall output is still a far cry from what our audience may have already experienced in scores of Hollywood movies that releases every week. This movie could have been an out-of the world experience for the viewers IF he had gotten his execution right. 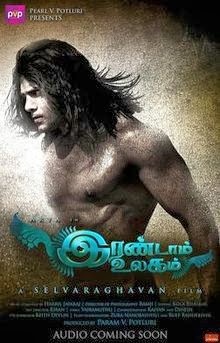 For now, Irandam Ulagam just happens to be an expensive experiment with unintended consequences. Varna is a flick brought to you by PVP cinema, kind of postulates this and much more. The film has a little bit of everything from the serious philosophical questions to some funny action episodes – feeless romance and a dash of gore. For all those who are used to watching mythical wonders that leave you spellbound, Varna could end up as a joke, at best. It is amateurish to the core, predictable and its making lacks any kind of imagination. Watch this one at your risk please.